Clean Up City of St. Augustine, Florida: SIX (6) Internet Gambling Cafes Turning 8.4 Square Mile St. Augustine Into "Trashy Tacky Tourist Town (TTTT)? SIX (6) Internet Gambling Cafes Turning 8.4 Square Mile St. Augustine Into "Trashy Tacky Tourist Town (TTTT)? PUBLIC NUISANCE ALERT re: SIX INTERNET GAMBLING CAFES" B.J. Kalaidi warned the City, which did exactly nothing to modify Internet cafe zoning, despite Allied Veterans scandal. Now, we've got six internet gambling cafes in the itty-bitty City. City Hall dropped the ball. Once again, more failure to enforce laws regulating corporate behavior inept City Attorney ISABELLE CHRISTINE LOPEZ? More desuetude by City of St. Augustine, by State of Florida, State's Attorney RALPH JOSEPH LARIZZA, Sheriff DAVID BERNARD SHOAR? At least it sounds like St. Augustine Beach's City Attorney is alert,St. Johns County is serving the public interest by refusing to grant permits. Thank you! We look to City of St. Augustine, Florida Mayor Nancy Shaver and Commissioners to lead the City on internet gambling cafes. Enough flummery, dupery and nincompoopery from ineffectual City Attorney ISABELLE CHRISTINE LOPEZ, a/k/a "DIZZY IZZY. We need a statewide search for a new City Attorney. Now. Several internet cafes or adult-gaming facilities have opened up shop in the city of St. Augustine, raising concerns among some in public office and law enforcement. St. Augustine allows businesses that call themselves internet cafes, a term often used for adult gaming facilities, to get a license to operate in the city. St. Johns County does not. That could be the reason several adult-gaming facilities call the city home. Internet cafes gained widespread negative attention in 2013 when authorities arrested dozens of people in a racketeering and money-laundering case involving St. Augustine-based Allied Veterans of the World, which ran gaming centers in Florida, according to Florida Times-Union reports. The Florida Legislature followed by banning sweepstakes rooms in 2013, and the move caused businesses that contained machines that resembled casino-style slot machines to shut down. But new cafes have opened since the 2013 ban that have sparked fresh investigations and questions about their legality. St. Augustine Police Department Assistant Chief Anthony Cuthbert said that police are looking at court cases that could provide clarity on the law. “We’re just monitoring the legal landscape to see if anything comes out of that ... For now, from what we can, tell they’re operating legally,” Cuthbert said. During a recent tour, six internet cafes, sweepstakes or adult gaming facilities were found around the city or its outskirts on South Dixie Highway, Anastasia Island, U.S. 1 and Masters Drive. The city of St. Augustine treats internet cafes like other businesses that want to operate in the city, and does not provide guidance on whether they are legal, City Attorney Isabelle Lopez told commissioners at a recent Commission meeting. The facilities are reviewed for zoning and building code compliance, and operators know they proceed with the risk of prosecutors seizing their machines to investigate whether they’re hosting illegal gambling, she said. The sweepstakes industry is regulated by Florida law, she said. 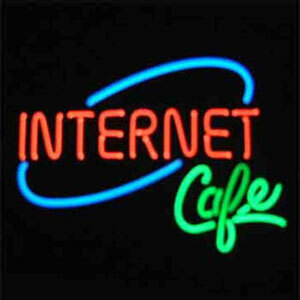 David Birchim, city Planning and Building Department director, said there’s no definition for internet cafes in the city’s zoning code, so trying to zone for them and distinguish between, say, coffee shops that offer internet access poses a problem. While St. Augustine allows the businesses to operate, St. Johns County has chosen a different path. After state law changed following the Allied Veterans investigation, St. Johns County chose to stop issuing business permits or renewing permits for adult gaming facilities such as internet cafes and sweepstakes business, said Michael Ryan, county spokesman. Because the county hasn’t issued permits or permit renewals, the number of internet cafes or related businesses in unincorporated St. Johns County went from 21 known businesses to one business, Ryan said. ″[That business] is operating without a business permit in St. Johns County,” Ryan said. The county has issued 32 citations against the business, Lucky Louie’s at 2548 U.S. 1, for operating without a business permit, Ryan said. The citations ranged from $118 and up to $268. The county also took the business to court, where a judge withheld adjudication and issued the business a fine, Ryan said. The county is looking at other ways to deal with the issue. Someone who answered a phone number listed for Lucky Louie’s on Friday hung up, saying “I’m not interested,” after a reporter identified herself. The county’s issues with Lucky Louie’s are about operating a business without a permit, Ryan said. The county does not make determinations about whether a business is involved in gambling. People at several internet cafes and gaming facilities around town declined to comment for the story. Robert Francis, cashier at Winners Internet Cafe & Sweepstakes on North Ponce de Leon Boulevard, said people technically buy internet time and can choose to play a game if they’d like. Some are cash machines, he said, meaning that you can play a game and win a voucher that’s redeemable for cash. "What you do with your internet time is your business,” he said. He also said most of the clientele are retired people, and that it’s a quiet and safe environment where no crime has occurred that he’s aware of. 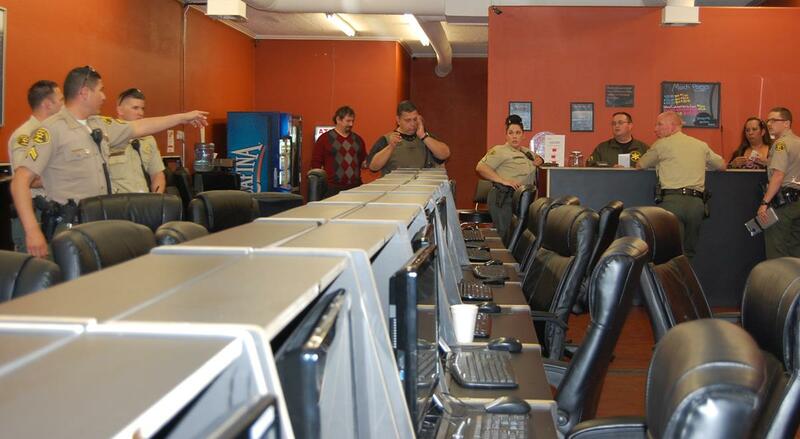 “I don’t know why there are concerns [about internet cafes],” he said. When asked for all reports related to any internet cafe since Jan. 1, the St. Augustine Police Department could only find one report. That was a purse-snatching that happened in March outside of an internet cafe on South Dixie Highway. Concerns about crime, and seeing the business activity in St. Augustine, is what caused St. Augustine Beach Police Chief Robert Hardwick to ask for the city attorney to see what can be done before one opens again in St. Augustine Beach, he said. Hardwick said he doesn’t know of any in the city, though an internet cafe used to be in the city limits. Beach City Attorney Jim Wilson said he’s not sure if an ordinance will be necessary. State law, as it stands, might take care of the issue, he said. ″[If a business complied with the state law] I think you’d be sitting there by yourself all day. ... I think they need to be looked into to see whether they are complying with the statute first,” Wilson said. 2. BUT on internet gambling dens, Ms. Lopez is NOT proactive at all. Wonder why? 5. Icy Isabelle Christine Lopez---typical unsophisticated, unimpressive, unscholarly, uncouth NE Flori-DUH government lawyer? 6. Kiss-up, kick down? Allergic to criticism? Incapable of answering questions? Book-smart, but lacking creative, responsive legislative or regulatory abilities? This is another Record fluff piece. Today’s paper is about 95% AP or similar, i.e. not locally written. RIP Record. 1. Why no interview of State's Attorney Ralph Joseph Larizza or of Sheriff David Shoar? 2. Why no interviews with law professors or criminologists? 3. Who owns the gambling dens? 5. Is Allied Veterans back in business? 6. Why not look up property and corporate records online? 7. Why is City Attorney Isabelle Christine Lopez so deferential to hideous gambling dens? She's a lickspittle for developers, too.